Another day, another demented villain. Seems like there's a never-ending supply of evil-doers for Bibleman to eradicate thru the power of God's Word. In this latest episode, the new kids TV network is spotlighting "celebrities" who influence kids in a bad way. What's so unusual about that? Turns out this network-WBIG, which stands for What's-Bad-Is-Good-is run by a super-cool anchor-dude whose chiseled countenance conceals his life's passion: blocking the gospel of Jesus Christ from reaching kids. Based on John 14: 6, that's not a mission-statement Bibleman is comfortable with. And when Bibleman is uncomfortable, villains begin to tremble. In this latest episode, the new kids TV network is spotlighting "celebrities" who influence kids in a bad way. What's so unusual about that? Turns out this network-WBIG, which stands for What's-Bad-Is-Good-is run by a super-cool anchor-dude whose chiseled countenance conceals his life's passion: blocking the gospel of Jesus Christ from reaching kids. Based on John 14:6, that's not a mission-statement Bibleman is comfortable with. And when Bibleman is uncomfortable, villains begin to tremble. 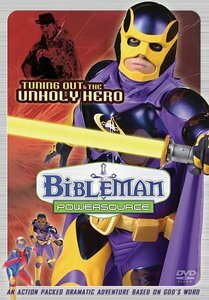 About "Tuning Out the Unholy Hero (Bibleman Powersource Series)"